Having a small kitchen may be a bit difficult, as it may seem cramped and crowded. This may deter you from using it as a living area, where friends and family can gather and have a great time. This is an essential thing to try to reverse, as the kitchen truly is the heart of the home. 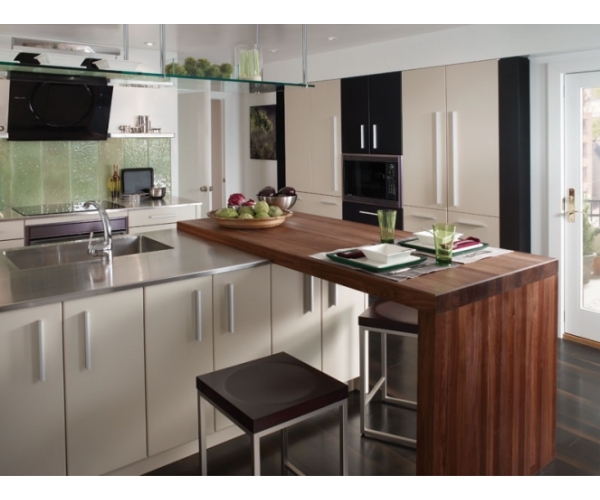 Let’s look at some of the things we can do to make your small kitchen appear larger than it really is. Utilizing an Open Floor Plan: By taking advantage of an open floor plan, you have the opportunity to create a spacious atmosphere. This is because, getting rid of the walls gives the perception that there is a lot more room, and you would feel a lot less closed off. Implementing Light Hues: Painting walls in lighter colors can help to open a room. On a similar note, adding lots of windows and increasing the amount of natural light works in the same way. Combining both of these things allows for a spectacular experience in interior design. This is probably one of the first things you will want to do, as it can be the most effective while maintaining simplicity. Clear Countertops: Clearing the countertops in your kitchen and removing any clutter makes all the difference. With cleared off countertops, we can see more surface area, making you feel less boxed-in. Simple & Downsized: This note is very similar to the point above, in that keeping everything simple and downsized can make sure there’s more physical room. This is not just an illusion as it makes sure that less room is taken up in your kitchen. From things such as decorations to appliances, just remember; less is more. Extra Storage: Adding some storage to the kitchen area can be a tricky situation. Adding storage spaces to areas you would not have guessed can be extremely helpful in that it can help to clear off those countertops! For more information on kitchen upgrades and the aspects and maintenance of kitchen maintenance, feel free to contact us by filling out our contact form, or contact us directly by calling 508-875-4004.